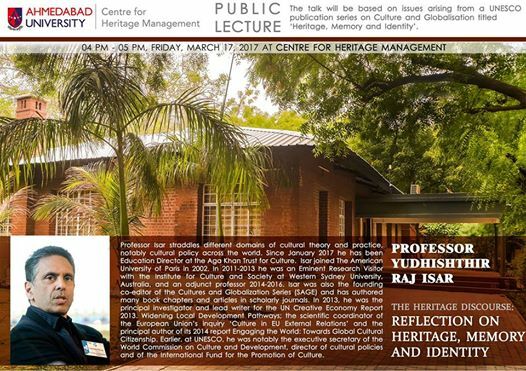 A PUBLIC LECTURE on ‘The Heritage Discourse: Reflection on Heritage, Memory and Identity’. The Talk will be based on issues arising from a UNESCO publication series on Culture and globalisation titled ‘ Heritage, Memory and Identity’. Professor Isar straddles different domains of cultural theory and practice, notably cultural policy across the world. Since January 2017 he has been Education Director at the Aga Khan Trust for Culture. Isar joined The American University of Paris in 2002 and was a Jean Monnet professor from 2003 to 2008. He has also been a Maître de Conférence at Sciences Po. In 2011-2013 he was an Eminent Research Visitor with the Institute for Culture and Society at Western Sydney University, Australia, and an adjunct professor 2014-2016. Isar was also the founding co-editor of the Cultures and Globalization Series (SAGE) and has authored many book chapters and articles in scholarly journals. In 2004-2008, he was president of the European arts and culture platform Culture Action Europe. He is a trustee of cultural organisations in Europe, Asia and North America and consultant to international organisations and foundations, as well as the European Commission. In 2013, he was the principal investigator and lead writer for the UN Creative Economy Report 2013. Widening Local Development Pathways; the scientific coordinator of the European Union’s inquiry ‘Culture in EU External Relations’ and the principal author of its 2014 report Engaging the World: Towards Global Cultural Citizenship. In 2015, he edited the monitoring report on the implementation of the 2005 cultural diversity Convention entitled Re|Shaping Cultural Policies and is currently Principal Editor of the 2017 edition. Earlier, at UNESCO, he was notably the executive secretary of the World Commission on Culture and Development, director of cultural policies and of the International Fund for the Promotion of Culture. In 1986-87, he served as the first executive director of the Aga Khan Program for Islamic Architecture at Harvard University and MIT.